Today is the Jewish festival of Purim commemorating the salvation from annihilation of the Jewish community of Persia thanks to their Jewish queen, Esther, around the 4th century BCE. The above link gives full details of the festival as well as the customs and foods associated with its celebration. 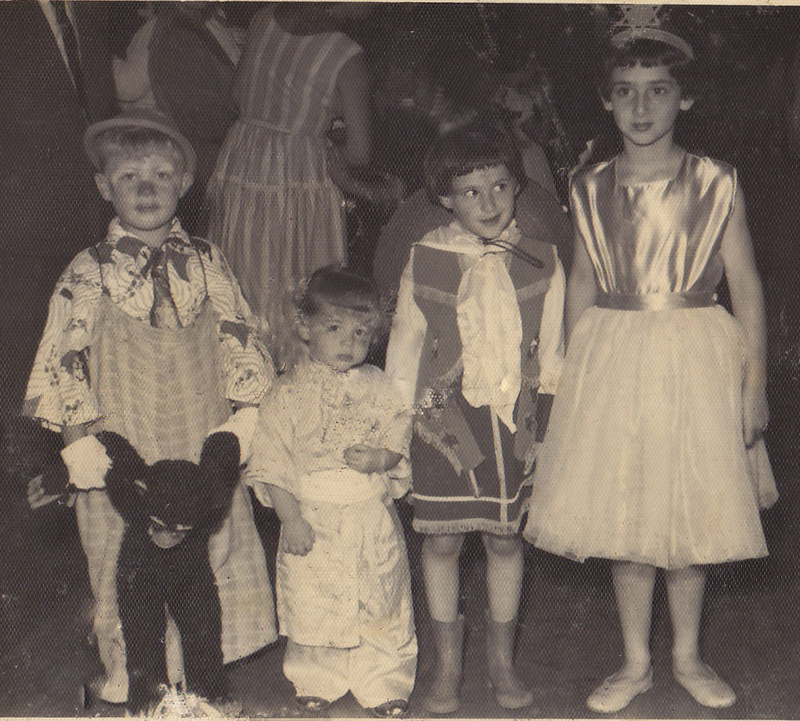 It is a joyous time, especially for children who dress up and are allowed to make lots of noise in the synagogue to drown out the name of Haman, the villain of the piece, each time it is mentioned during the reading of the Book of Esther. It is traditional to send gifts of food and drink to one’s family and friends and to make charitable donations to the needy. It is a festival where drinking to excess is not only permitted, but encouraged! 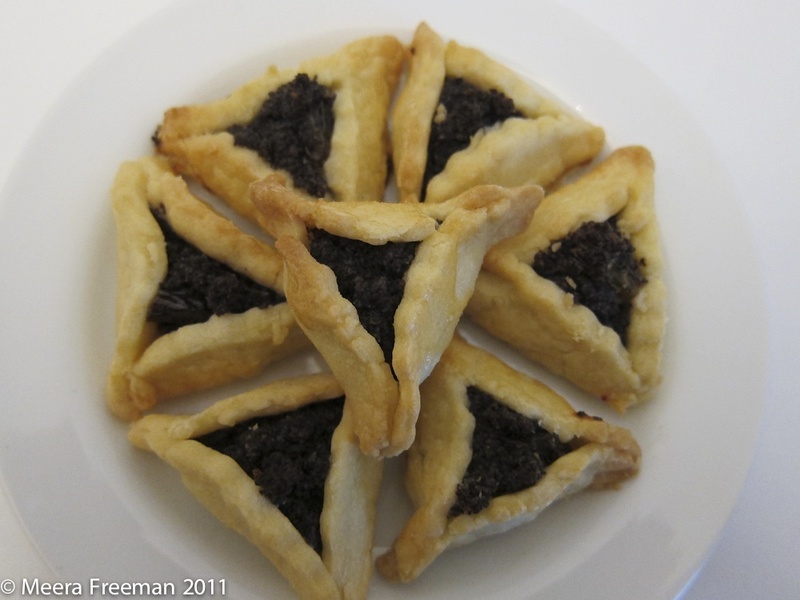 The traditional pastry baked on the occasion of Purim is known in Hebrew as Oznei Haman (Haman’s ears), a triangular pastry filled with poppy seeds or fruit preserves and, these days, other more modern fillings containing chocolate. My favourite recipe is adapted from Claudia Roden’s Book of Jewish food. 1 1/2 tbsp unsalted butter. To make the dough, process the flour, salt and sugar in a food processor. Add the butter, cut into small pieces and process until the mixture resembles coarse breadcrumbs then add the vanilla extract, egg and milk and process until the dough forms a ball. Wrap in plastic wrap and refrigerate for 30 mins. To make the filling, simmer the poppyseed and milk in a small saucepan for 5 minutes or so allowing the milk to be absorbed. Add the sugar, honey and sultanas and simmer for a few more minutes. Off the heat, stir in the lemon zest and juice, mixing well. Set aside to cool. Divide the dough into 4 parts. Roll out one quarter of the dough to a thickness of 3mm (keeping the rest of the dough chilled in the refrigerator). Using a 7.5cm fluted cutter, cut out rounds. Place a heaped tsp of filling in the centre of each round and pinch the sides up to form triangular pastries. Brush with the egg wash and bake of 10-15 minutes until golden. Allow to cool before CAREFULLY transferring them to a serving dish. They are quite fragile. If you have the time, you can make half sized pastries to serve as petits fours… more fiddly to make but very elegant!